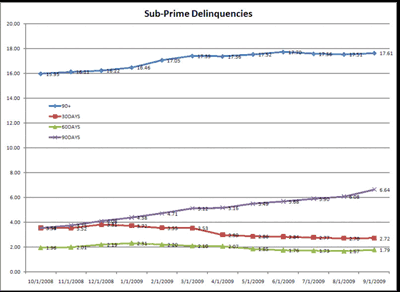 Is Unemployment the Key Driver of Recent Delinquencies? 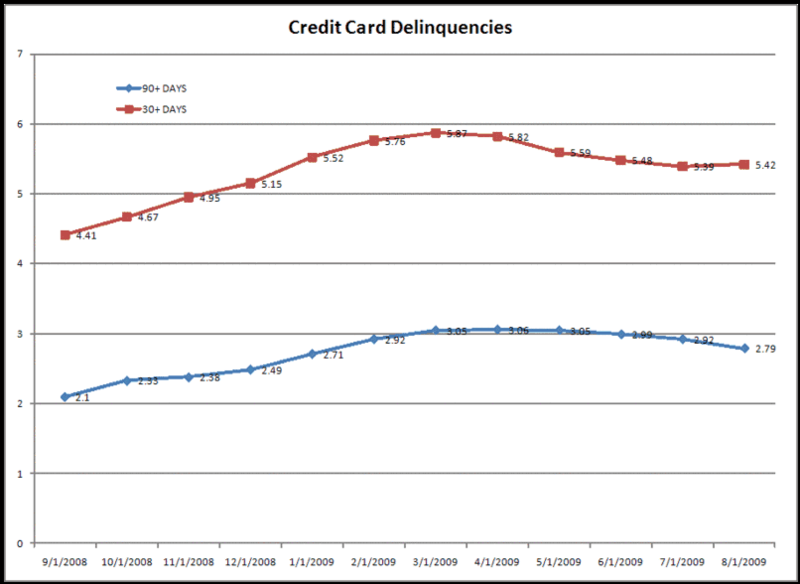 HomeBusinessIs Unemployment the Key Driver of Recent Delinquencies? Obviously the chart above is what it is, and certainly doesn’t show any leveling off. However, it isn’t consumer specific, and the commenter’s argument was about consumer loans. I thought I’d share how I track consumer loans. I use a sampling of securitized mortgages and credit cards. This isn’t perfect. First I’m taking a sampling which always has risks. 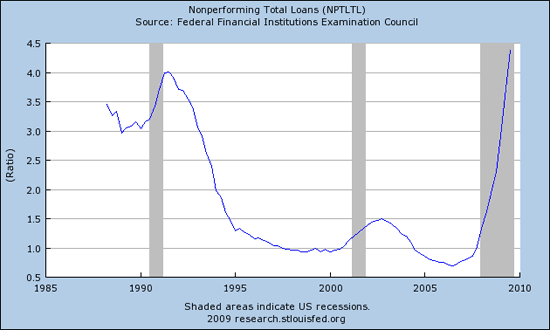 Second, there is probably a bias to loans that have been securitized. Most likely securitized loans are somewhat worse than loans held on balance sheet by the same bank. It is also likely that there is some bias by what types of loans fit into securitized pools, what kinds of structures investors demanded, etc. However, the advantage is that the data is available much quicker than other sources. So the above chart from the St. Louis Fed is only updated to 2Q, I have data up to August, and in two weeks I’ll have September. Plus I can limit my sampling to certain vintages. In particular I look most closely at 2006 and 2007 vintages for mortgages. Anyway, here is my data. First sub-prime home equity (comparable to the ABX). I’ve got four lines. The 30, 60, and 90 are unique sets, where as 90+ includes everything from 3-months late to foreclosed. So I think that’s the most interesting set. There is obviously a leveling out here. Obviously if we took the time series back a year or two, you’d see a huge ramp up. Note that the 90 day bucket keeps rising (despite falling 30’s and 60’s) and that tells you that once a mortgage goes delinquent, it just keeps moving through to foreclosure. Then non-conforming prime mortgages. Remember these are mostly stuff like Option ARMs, low docs, and/or other creative financings. Again, its my own sampling of RMBS deals from 2006 and 2007, so it won’t necessarily match up with any other statistics out there. That’s still rising, but again, at a much slower pace compared with last year. I think both of these are consistent with a burning out of the bad lending that was going on in 2006-2007. Finally I have credit cards. These are a little different than mortgage securitizations because the lending period tends to be so short. So here I’ve ignored vintage and just gone with the master trust data. 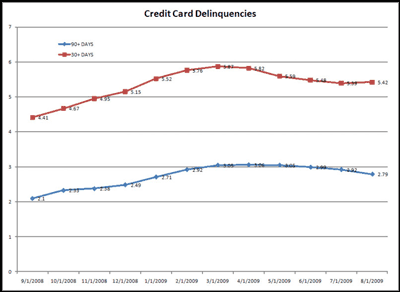 Note also that this shows 30+ whereas the other charts had 30 day delinquencies as a unique bucket. Here is my point. All is not right with the world. Banks are still struggling with bad consumer loans. Commercial loan problems are just now beginning. However to suggest that unemployment is a key driver of recent delinquencies just doesn’t fit the data. 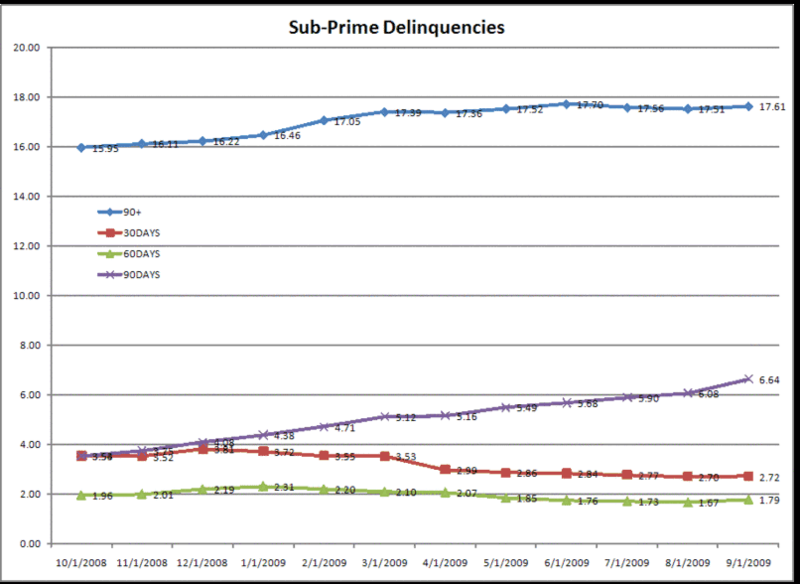 Delinquencies are leveling out just as unemployment is ramping up. Of course, when people lose their jobs it certain has a negative effect on their ability to service debt. So I think the correct way to think about this is that we really have two waves of consumer loan losses. The first is related to bad lending. These are burning out now and won’t be a problem on the margins going forward. The second is old-fashioned recession style delinquencies. The reasonably structured loan that goes bad because someone lost their job. Obviously those will be increasing with unemployment. But I suspect that losses related to bad lending will dwarf those from this second wave of delinquencies related to unemployment. In terms of a macro-economic view, I think the consequences of all this are more negative for banks than for consumer spending. Although I’m not terribly bullish on consumer spending, I do think consumers keep consuming at some reasonable pace. The people with jobs will keep spending, and the people who lose their jobs will resume spending once they find work. However even if consumer lending losses are leveling off here, they are still very high, and commercial lending problems are just now coming to fore. How Innocuous Is a Treasury Default?